Venous thromboembolism (VTE) is a common complication after total hip arthroplasty (THA) or total knee arthroplasty (TKA) and may be the cause for a secondary PE and associated morbidity/mortality. We performed a systematic literature review of risk factors and risk reduction of VTE after THA or TKA. 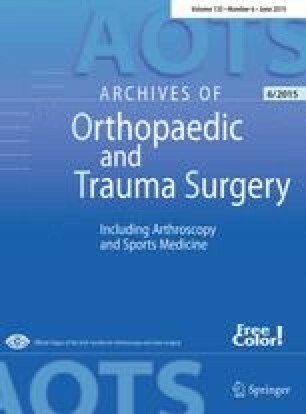 A systematic search of PubMed database, the Cochrane Library, OVID MEDLINE and American Academy of Orthopaedic Surgeons (AAOS), without restriction of publication data and language, was conducted. We performed a meta-analysis of ten factors for VTE after THA or TKA. Four authors independently assessed data extraction and quality of the studies using the Newcastle-Ottawa Scale (NOS) as quality assessment tool. Assessment of heterogeneity and analysis of data were operated by Review Manager 5.2.9. Fourteen retrospective case–control or prospective cohort studies, which included 18,075 patients who developed VTE after THA or TKA of a total of 1,723,350 cases, were selected. Our results demonstrated that, among all ten factors investigated, 3 main risk factors were significantly associated with VTE after THA or TKA: history of VTE (RR > 10.6), varicose vein (RR > 2.7) and congestive cardiac failure (RR 2). There was also an increase of VTE risk ranging from 8 to 30 % for female gender < age (≥80) < hypertension < (active) cancer < obesity (BMI ≥ 30) < (black) race. Data analysis revealed that diabetes mellitus had no significant relationship with VTE after THA or TKA. This study highlighted the role of nine significant risk factors in the development of VTE after THA or TKA. Among all risk factors, history of VTE seems the one main indication for more potent anticoagulation. All other risk factors need to be considered and discussed with patients individually and balanced against the risk of bleeding and infection. Individual patient risk assessment, rather than a “blanket policy”, is considered the best management strategy before deciding on the type of chemical prophylaxis. All the five authors contributed equally to this paper. Thanks to Professor Jing Tian for his enlightenment in the process of selection of the topic and for his support to revise our paper as well as to give us valuable comments on the draft version of the paper despite his busy schedule. His instruction gave us great help in the completion of our study.